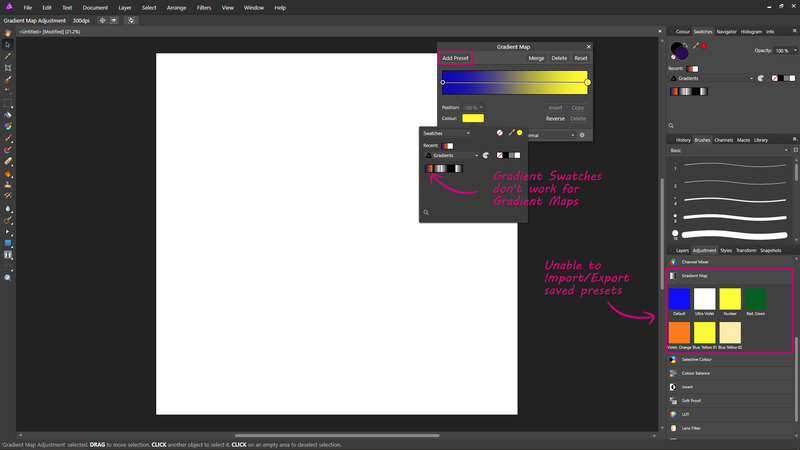 When creating a Gradient for a Gradient Map, in order to save it the only option seems to be to click the 'Add Preset' button, which adds it as an adjustment preset. The problem is that there doesn't appear to be any way to import/export these presets. I've instead tried saving gradients as Swatches (as Swatches can be imported/exported), but these don't work properly for Gradient Maps. Is there a way to import/export Gradients for Gradient Maps that I'm overlooking? Well, I guess that answers that question. Maybe this post should be moved over to the 'Feature Requests' section instead. As an interim solution, will copying the below file across to a new computer transfer the settings across? Or is this likely to cause problems? Yeah, if it recognised Gradient Swatches that would be the ideal solution for me too. I'm not sure why it doesn't recognise them, instead it just uses the left most part of the Gradient Swatch and ignores everything else. Where is this "add Preset" button you speak of? In the screenshot in the original post, it's in the top left corner of the 'Gradient Map' panel. Moved to the Feature Requests section. The gradients stored in the Swatches panel were not intended to be used with the Colour well control since it only applies to the selected node which can only has a single colour. Quote : " Would be great if gradient swatches could be applied to the gradient map adjustment "
Any news on this for the next APhoto beta (or release) ?